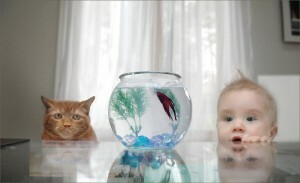 Babies and Cats have much in common with each other, mom and the family. As you know from your own experience, a woman’s work is never done. Up at 5:00 A.M., breakfast, packing lunches, going to work, being soccer mom, cooking dinner, bed time stories for her children and then a late evening secret meeting with her husband (AKA Her Lover). Now that we understand and appreciate Mom’s day lets compare why Babies and Cats are like each other in many ways.